A 3V 100mA (max) Crystalline Solar Cell, finished with epoxy resin making it waterproof. Dimensions: 60mm x 48mm x 3mm. Supplied with 20cm leads. This crystalline solar cell is finished with epoxy resin making it waterproof. Connection is via 2 x 20cm leads connected to the solder pads on the back. Q: Can the solar module power the microbit card? Q: I have purchased this with motor 2501-01 for my sons science project. Can you please let me know can I use a halogen torch as a power source to demonstrate solar energy? if yes, what kind of torch do I need to purchase? A: Hi Rahul, You should be able to use a halogen torch, however the solar cell will work best with natural light. You may also be able to get it to work with incandescent and fluorescent bulbs, however again it may not work as well as it would with natural sunlight. Q: I have a solar battery light for a dark corner outside my house, but it does not receive enough sunlight so I intend to add a more powerful solar cell in parallel that I can position to catch more light. Do I need to run this through a diode? How would a diode help, if it does? What capacity diode would be appropriate for a 3V, 100mA cell? A: Hi there, If you connect it directly to a component then it should still be powered, provided it can supply enough current. It just helps to add a diode into the circuit. Q: I have to charge a lithium 3v RCR123A in winter sunlight. How many of these cells would need to be connected together to achieve this? Also, would a diode be necessary? BW. Hi John, After having a look into these batteries it is stressed that the original charger should be used to charge the batteries and you shouldn’t create/use a different charge. As such we aren’t able to provide any further recommendations other than this. Sorry. Hi Pete, We have looked into this via a datasheet and testing this ourselves and unfortunately during winter sun you wouldn’t be able to get the solar cell to output enough current to charge this battery. During direct sun it would be able to, but shaded or indirect sun light wouldn’t be able to produce enough voltage or current. You could in theory use a solar cell to charge a battery. To charge a 9V battery you would want to us 2 5V solar cells, https://www.kitronik.co.uk/3608-50v-130ma-polycrystalline-solar-cell.html connected in series along with your diode. This will drop the voltage from 10V’s to around 9.3V’s, and depending on the capacity of the battery would depend on the length of time it would take to charge. The maximum that can be outputted is 100mA, however this requires direct and constant sunlight. You will likely measure less than this depending on the intensity of the sun. You would need to connect the solar cells to some rechargeable batteries these would then be connected to the Arduino and LEDs. You would also need to use a diode to stop the batteries discharging through the solar cell when it gets dark. Q: Dear Sir, I want to use this cell to light up a light bulb, but how pls? What size Lithium battery would I need and what would I connect to what to light up my ordinary old fashioned light bulb, please? Ordinary light bulbs will only run from alternating current, batteries supply direct current and as such you wouldn’t be able to create this circuit. A: It wouldn't charge it. The main reason being the cell is 3V and an iPad charger uses 5V. I would advise you not to try to modify a charger for such a device as there's a good chance you could end up destroying your iPad or even starting a fire. These devices all use Lithium type batteries which are known to catch fire if charged incorrectly or otherwise damaged. 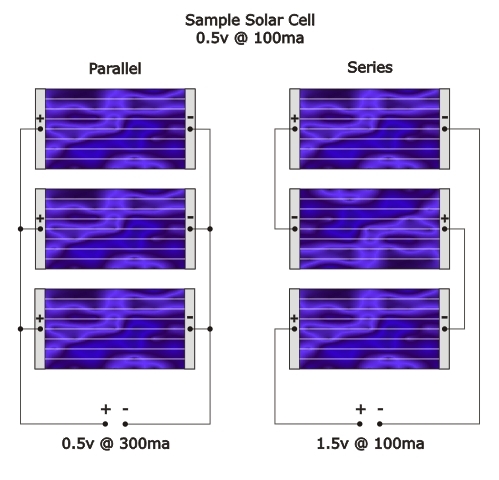 Q: Please can you tell me how long do your SOLAR CELLS last? Barry. A: Pmax (the maximum power the cell can provide) will decay by about 10% every 10 years. Of course this is effected by things such as temperature and weather exposure so your mileage may vary, but they last a pretty long time and slowly lose efficiency rather than outright failing. Q: I have two questions: 1. Are these panels waterproof? 2. Can I wire 2 groups of 4 panels in series in parallel? So this would create a total of 12V output? A: The panels are fairly water resistant as they are coated in an epoxy resin. 4 cells in series gives 12V yes. Two groups of 4 could also be put in parallel for more current. Please remember though that the current rating of the solar cells is an ideal maximum under perfect conditions. In reality you get a lot less.